Alright friends here are my answers from the Q&A 'Curious' post here! Thanks SO much to everyone who asked them and I hope these answer them well! If not, let me know and I'll see what I can do for ya! I kind of answered this in a guest post for Gentri Lee here but here is the full version! 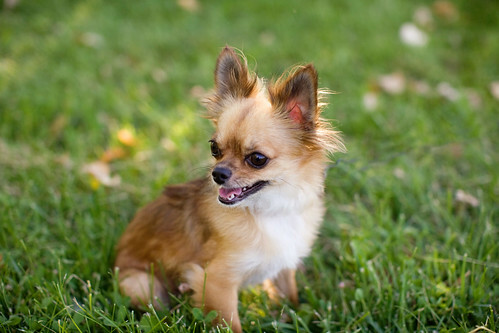 Kevin and I got Katinka, our 2 year old long-haired chihuahua. We were trying to think of fun names for her and wasn't sure where to go. We wanted to name her something funky and weird but cool at the same time because you can't name your kids weird names! I started looking into European names and just names from other countries in general. We were looking at Russian names for the fun of it and I said Babushka as a joke and then we were thinking of our favorite movies and of course Zoolander was brought up... and Katinka was born! Do you remember Katinka Ingabagovinana...na from Zoolander? She is the short dark-haired lady? Well we named our dog after her! Lol. At first I was embarrassed to tell people her name. I took her to the vet and they asked her name and I said I wasn't sure yet... but then finally I started just saying it...and she was kind of a sassy little thing so it worked out perfect! Katinka is a perfect name for her haha. I call her Tinka or Tinks for short sometime! Ah, I love her! So that is how we named her Katinka!!! No, I am not on any diet but maybe I should be. I honestly eat horrible! I eat what I want, when I want and I eat when I am not even hungry. This is something that I would like to change, but it is easier said than done. I wish I knew more about nutrition, health, and exercise but I slept through the GE Introduction to Health and Fitness class at BYU. It was at 8am and I was not waking up for that lol. Growing up I was always tall and on the lean side however ever since I got to BYU and got married I think I gained a little of weight, probably 10-ish lbs. Freshman year, a lot of girls in the dorms were talking about calories and not eating food past 9pm and I was like huh? What? I don't do that? What is a calorie? Anyways, I've learned more since then haha. But I really do need to eat healthier and eat all the different types of foods in the food pyramid daily. As far as working out goes I am off and on. I am really good for awhile and then really bad. I love to workout but sometimes it is just hard to make it happen! I do much better when I have a gym membership so we will see about that! I just started doing P90X mixed in with tennis, running, and weights, so that is what I have been attempting these days. It just all went downhill since I moved to Colorado because I had a gym pass in Utah and Gold's Gym wouldn't transfer it to the closest location here. So shame on Gold's Gym! So that is the latest since I've graduated. I really miss TurboKick (kickboxing) and Zumba!!! Absolutely! For those of you who don't know, my husband played collegiate baseball at BYU. He played all 4 years and played 3rd base and pitcher. His last year as a pitcher he dominated! He had the best win-loss record on his team and an insanely great ERA. He was 2nd team All Mountain West Conference. I wasn't working for most of the time he played college baseball so I was able to attend most of his games! I would sit with all of the Baseball wives - there were around 10 of us - and we would go on road trips to watch them and hung out while they were on away games, which was pretty much every week and weekend! Those days were so fun and I miss them and the wives as well! It was just so fun to watch the team, get all into it, learn a lot about baseball, and get stressed out in close games when my husband would come in as a relief pitcher haha. More on BYU Baseball here! Honestly, I love Fort Collins, Colorado! I grew up in Fort Collins and just moved back there from Provo, Utah where I attended BYU! I would love it 100x more if BYU was here and my friends I met from there were here :) That is the only downside but I guess you have to graduate and move away from college sometime! I love living in a dry climate and dislike humidity. I love living by the mountains! One of my favorite things to do is snowboard and enjoy the mountains in the summer as well! BUT...I think it would be amazing to live in Italy or Germany for a year or so. I took four years of German in high school and visited Germany twice. My grandma, Omi, is 100% German and she makes the best German food. I love the food and it is gorgeous out there - the castles and the Black Forest and everything! I think it would be fun to live in Italy as well since Kevin served his mission there and is fluent in Italian! The food is amazing and it is such a gorgeous romantic country! I think Europe would be fun temporary. I actually have the perfect one piece jump suit in mind, however, it is packed in our garage right now! We are currently living at my parents so once we move, I will unpack, find it, and get a picture for you! :) It is a Bebe jumpsuit that I got at a Bebe outlet store in Hawaii for $15 to wear to a random party! It is kind of a Veronica Corningstone outfit from Anchorman to give you a visual haha! I'm surprised no one else asked too, ha! So I would say...probably within a year? That's about all I am going to say ha. And in case you are wondering, nope I am not pregnant right now! So I kind of just wrote a post on what I am reading this month so take a look at it here. And we had some dancing requests...to see my clogging skills! I posted 2 videos here for your viewing pleasure! Hopefully this was fun for you to read and let me know if you have any other questions or requests! Thanks! I've always wondered about Katinka's name. I don't think it's weird it all, I like it! Very cute post. My furbaby doesn't have a common name either. His name is Claymore. He's named after a land mine (my hubby is in the Army)! Great vet to know you! Hehehe, Katinka! I knew I heard that name from somewhere! That is absolutely adorable :) Great post! Great post! I learned lots about you! Katinka is absolutely adorable! getting a lot of that now, myself. ahh, i love this. katinka is just the cutest. i might just have to do this Q&A soon too! How fun! Your pup is so CUTE! How fun! :] you are adorable! Are you going to the meet up in utah? And you live in Rexburg?! huzzah for a new blog buddy! you put a star in my night:) and i hope you can go back and visit your college buddies often! seriously you are too cute! Katina from zoolander...I seriously should have made that connection!!! You are so lucky you can eat whenever you want:) lucky girl! Loved this. Thanks for answering my question!! I love that Katinka got her name from Zoolander! I LOVE that movie and it fits her perfectly! Just came across your blog and decided to leave some blog lovin' :) Your blog is so cute. I love reading your little adventures. And would love to see your tutorial for curly/wavy hair. You would think that me being a hair stylist I would get it, but I have such a hard time achieving it for myself. you better stop with this 'I am naturally skinny no matter what I do' thing or we wont be friends anymore hahaha ;) jk fun questions! cute! this is a good idea :) Good way for people to get to know more about you! Thank you for following my blog! I was a clogger back in the day too but I was never very good. I was much better at ballet, jazz and modern. I love posts like this.